Remember when you woke up on New Year’s Day and immediately sprang into action on all those realistic goals you set forth the week before? Yeah, neither do I! I recall waking up on New Year’s Day, sipping coffee in my pajamas, scrolling through Netflix, munching on something from Hickory Farms and half-heartedly proclaiming, “I’ll start tomorrow. Tomorrow is the first REAL day of 2019.” I had good intentions, but zero direction on that first day of this fresh new season. Thomas Edison once said, “A vision without execution is hallucination.” I suppose that means I was borderline psychotic for the first several hours of this year, but lucky for me I quickly found my way into remission! During my first Sunday church service of the year, our beloved Pastor Craig Groeschel reminded us that “our life is the sum total of all the small decisions that we make.” This made me realize that most of us approach our resolutions and personal goals in all the WRONG ways! We’ve been told much of our life to focus on the BIG picture. “Keep your eye on the goal!” “Focus on the prize!” However, with our eyes exclusively on the reward, we overlook the individual steps it takes to get there, and then we wonder why we never made it. In his book “Atomic Habits,” James Clear says, “You do not rise to the level of your goals. You fall to the level of your systems.” So in order to simplify our strategies for bringing our personal goals to life, we must first take a look at our systems. 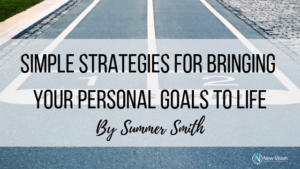 Let’s identify what we tend to do wrong when approaching our personal goals, then let’s visualize the improved version of ourselves and choose one small new system for getting there. I believe the problem we often make when approaching our goals is that we focus on BIG, BROAD and BEST. For example, “I’m going to rise to the top this year!” Too big – Too broad! Or perhaps we say, “I’m going to get my life together.” Your LIFE entails no less than 100,000 different things, so how and where exactly does one begin? Too broad! You might even say, “I’m ready to be the BEST version of myself!” Unfortunately, BETTER must come before BEST, so if you only focus on the best, you might miss all the small, meaningful victories along the way and then give up prematurely. Voltaire said, “The best is the enemy of the good.” Smart guy, that Voltaire! If we set our personal goals around big, broad or best, we don’t know where to begin, we miss small (but important) achievements and we give up too soon! So if we aren’t supposed to start BIG, BROAD or BEST – then what are we supposed to do? You guessed it! We should start small, specific and satisfying. The Bible says, in Job Chapter 8, “Your beginnings will seem humble, so prosperous your future will be”. Small beginnings are the key to realistic outcomes! Specific beginnings are the arrows on the map. If I am going to save more money, I need an exact amount per week (or month) to get started. If I am going to lose weight, I need an exact macro count, calorie count or fitness plan to execute each day. If I am going to pray more often, I need to identify the exact number of minutes I’m striving for. Finally, why must it be satisfying? Because let’s face it, we live in a generation of immediate gratification. If I need information, Google answers the call in less than one second. If I want something but don’t have the cash for it, Capitol One Venture Rewards Card! Amazon delivers things to your doorstep faster than you can press “buy now,” and Uber shows up quicker than I can walk to my driveway and engage the ignition of my own car. We must choose small steps that are satisfying because if we don’t get some type of gratification fairly quickly, we are more likely to give up. If I choose “pray 3 minutes each morning after I wake up” as my faith-seeking goal, then it will only take 3 minutes before I feel the satisfaction of completing that goal (and likely, God will reward me with answers!) Satisfying steps keep us moving!